It's all about the varied textures and mixed metals in this fun, industrial themed new jewelry style! 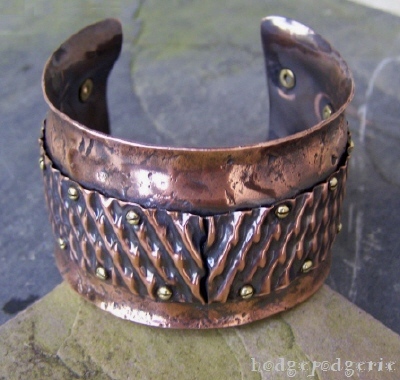 Combine Sterling silver, brass and copper to create your own unique cuff bracelet! Sort of steampunk, but not quite...no robot guts! :) More, well...industrial, I think. But feel free to bring your own watch parts or whatever suits your style. You'll learn to texture metal with hammer impressions and milling, and by using some unusual tools such as tube ringers and hair-dye turn keys. 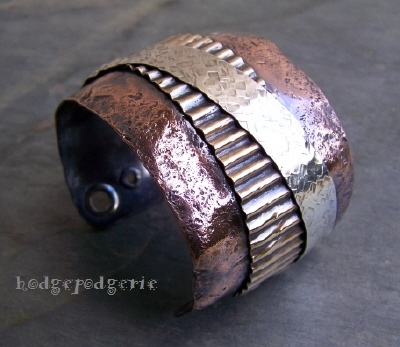 Layers of textured metal are then punched and riveted together to create a unique look. You'll then "age" your pieces to enhance all the cool textures. Torches will be used to anneal the metal. After creating your own unique cuff, if time allows, you'll create a matching pair of earrings! "It's amazing what I was able to create in such a short period of time!" 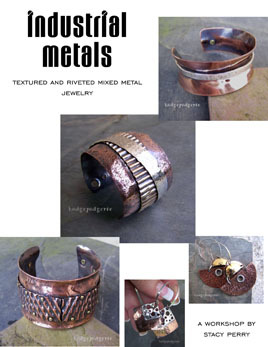 Return from "Industrial Metals Workshop" page to "Wire & Metal Jewelry Classes" page.